Diamonds are indeed a girl's best friend! Many believe that diamonds are the ultimate symbol of love and commitment. Much of this belief can be attributed to the breath-taking, scintillating, sparkling beauty of the polished stone. Fine diamonds take millions of years to form, have endured intense volcanic pressure, and could have been mined and extracted from extremely dangerous situations. For those of you who have seen the movie "Blood Diamond", you are now well aware of some of these extreme dangers as well as the fact that diamonds have been mined in the most questionable ways and been used to fund violence and civil wars. The Kimberly Process is one safeguard that hopes to stop this nefarious activity by providing a safeguard via a traceable guarantee on the whole supply chain of any particular diamond. These diamonds can be tracked from the mine, through sorting, cutting, and distribution to the markets. Whenever you buy diamonds, you should always confirm that the diamond complies with the Kimberly Process. It is safer for you and is another small but needful and important step to ensure that we no not support nor encourage the horrors as portrayed in the movie "Blood Diamond". The cut is the one that is most influenced by humans as the other 3 Cs are predetermined by nature. Carat Just like other precious stones, carat is the weight unit of measurement for diamonds. A carat is 200milligrams (0.2 grams). 1 carat is also equivalent to 100 points, so that half a carat (0.5ct) is also denoted as 50 points. Note that the price of diamonds is not linearly related to its carat (weight). Clarity is about how free the diamond is free from inclusion and blemishes. Inclusions are traces of non-crystallised carbon or other non-diamond crystals. Almost every diamond has inclusions and is unique per diamond, like finger prints are unique for humans. The brilliance of diamonds from the reflection and refraction of light going through and being reflect and refracted out from the diamond. If there is anything in the diamond that disrupts this flow, the brilliance is affected and reduced. Inclusions and blemishes are these obstacles in that path of light which causes a certain amount of loss in the reflected light from the diamonds. Diamond clarity is graded by the amont of these inclusions and blemishes within. The less the better. The colour of diamonds refers to the intensity or the lack of colour. There are gradings of diamond within the white range. If the diamond has colour, they are normally assigned fancy and descriptive names like "fancy intense yellow" or "fancy vivid purplish pink". However with coloured diamonds, the more intense the colouring, the more expensive it is because they are scare. In fact, an intense coloured diamond can even be more expensive than a colourless diamond based on their relative scarcity. This is the one criterion that is most influencable by humans and believed by many to be the most important of the 4Cs. The cut of a diamond does not refer to the shape of a diamond but rather to the quality of the cut. It is the precision of the cut which determines the proportion, finish, and symmetry of the diamond - giving it the fire and brilliance that is so highly valued. It is in the cut of a diamond that a rough diamond is transformed into a highly valued and polished stone. 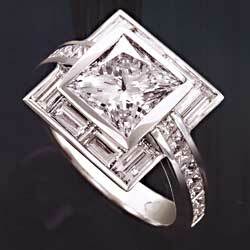 It is the cut of a diamond that will most dramatically influences its final fire and sparkle. 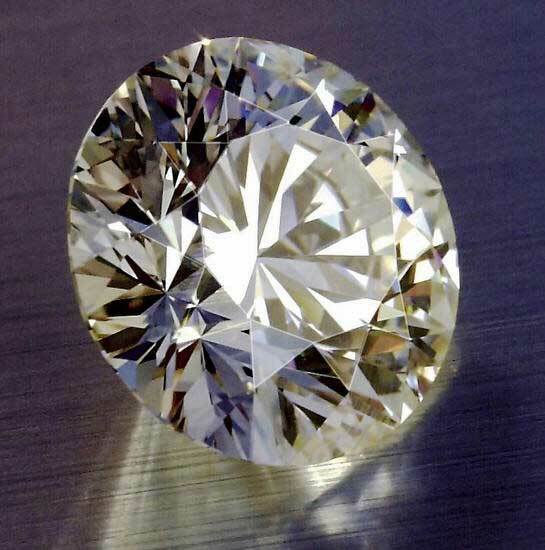 A well cut diamond can increase the sparkele and brilliance because when cut well, light will also reflect internally from one polished surface to another. Not only will a well-cut diamond minimise any inherent imperfections in the diamond, but you can actually buy a well-cut stone with lower clarity at a lesser price and find that it actually can look livelier than a diamond of superior clarity. "Make" is the term used by professionals to describe the overal quality of the cutting. A diamond with an 'excellent make' will of course fetch a higher price than one with a 'fair make'. And 'ideal' or 'super-ideal' make will fetch a premium price. It takes much skill and time to produce one of those. In fact, on average, a 'rough' diamond can lose as much as 60% of its weight to become a 'super-ideal'!! Of these shapes, the round brilliant shape is the most abundant because specific proportions and facet arrangements have been accepted by the diamond industry. Like all other jewellery, it is advisable to remove your them when doing hard labour like gardening or cleaning. Chemicals can affect and dull the brilliance of your diamond. 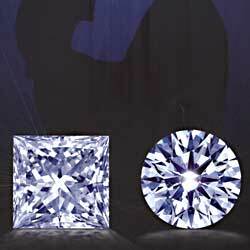 Always make sure that your diamonds are well and securely set. If loose, get them repaired immediately by your jewellery to prevent heart-breaking loss of such an expensive stone. Do not store your diamonds 'in the raw' together with your other jewellery. Diamonds, being the hardest of stones, it will cut and scratch your other items. So always make sure that each is individually wrapped and stored in a fabric-lined case. It is preferable to get your diamonds polished professionally. When cleaning them yourself, use mild dishwashing detergent and warm water, then rinse immediately and dry with a clean cloth.